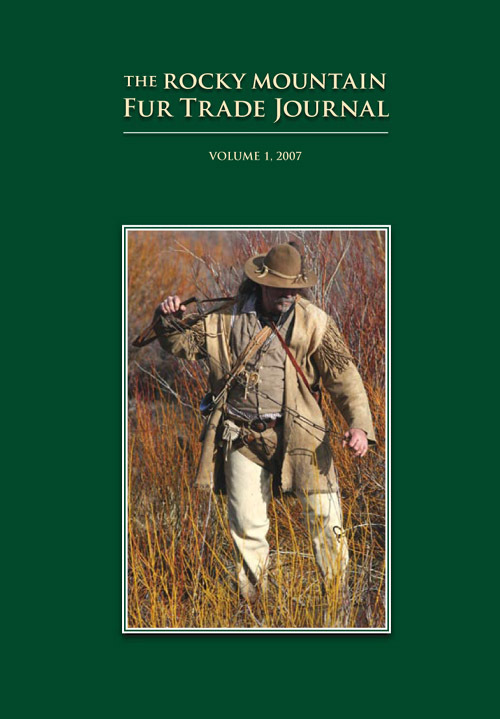 More than 40 people chipped in to make the first edition of the Rocky Mountain Fur Trade Journal a great success. We appreciate all the authors that were willing to submit papers and give this publication a chance. We also owe a debt of gratitude to the peer reviewers who lent us their expertise and credibility, trusting that this new unknown publication would be worthy of their participation. Dr. S. Matthew DeSpain – is a Visiting Assistant Professor in the Department of History at the University of Oklahoma. He is also the editor of The Journal of Chickasaw History and Culture and a tribal historian for the Chickasaw Nation. Keith “Moki” Hipol was born and raised in the Hawaiian islands. During his service in Uncle Sam’s grey iron canoe club he got to circumnavigate the globe via Southeast Asia. Later he attended the University of Hawaii-Hilo then moved to Wyoming in 1984. Some of his interests include the study of history, artwork, music, and enjoying activities in the great outdoors. Moki is a member of the American Mountain Men. Moki’s family includes his wife Mary and his daughters Hana and Leilani. Brad Tennant is an Assistant Professor of History at Presentation College in Aberdeen, South Dakota. A native of Orem, Utah, Dale Topham received his Bachelor of Arts and Master of Arts degrees from Brigham Young University. He is presently pursuing a doctorate degree in American history> at Southern Methodist University in Dallas, Texas. Ken Zontek, Ph.D, teaches history at Yakima Valley Community College in Yakima, Washington and serves as an adjunct professor at nearby Heritage University in Toppenish, Washington on the Yakama Reservation. University of Nebraska Press released his monograph, Buffalo Nation: The American Indian Effort to Restore the Bison, in March 2007. He considers himself both an environmental historian and> ethno-historian focused on the North American West. James C. Auld is an independent historian of the Western American fur trade of the early 19th century. He has researched and written about Jedediah Smith and the fur trade for over fifteen years. He holds a history degree from Northern Illinois University. Jim assisted with the production of the History Channel presentation, “Taming the Wild West” and was also featured in it. Stephen V. Banks of Dubois, Wyoming is a lecturer and re-enactor of the Rocky Mountain fur trade. Banks studied western history and American Indian history at the University of Wyoming and has published a number of articles in books, periodicals and newspapers. Bruce “Burnt Spoon” Druliner has been living, dreaming, reading about and experiencing the life of mountain men and Indians since boyhood. In 1983 he became associated with American Mountain Men, Inc. In addition to his buckskin experiential anthropology, Bruce worked four seasons as a park ranger at Fort Union Trading Post NHS and currently spends his summers living in and conducting tours of Montana’s Old Fort Benton. Brenda D. Francis, MA, Brigham Young University, was editor and co-author of The Fur Trade & Rendezvous of the Green River Valley (Sublette County Historical Society, 2005). She works as a principal software quality engineer for a software company and is pursuing a PhD in American history. Richard M. Gadler has a BS in History and Historic Sites Archaeology from the University of San Diego and has done graduate work in those fields. He was employed by the County of San Diego, California as an environmental scientist, with a specialty in archaeology, for ten years. He has been a student and collector of antique arms and accoutrements for much of his life with a preference for the Kentucky rifle. Todd D. Glover has been an avid fur trade historian for the past thirty years. He spends much of his time researching, experimenting and recreating the lifestyle of the original Rocky Mountain based trappers and traders. He is a member of the American Mountain Men, Inc.
Jim Hardee graduated from the University of the Pacific, Stockton, California. He has served as Director of the Fur Trade Research Center since 1998. He is the Museum Factor for the American Mountain Men, Inc. and is past-President of the Jedediah Smith Society. Jim served as the historical and technical advisor for the History Channel presentation, “Taming the Wild West” and was featured in the program. Donald L. Hardesty is Professor of Anthropology at the University of Nevada, Reno. He received his Ph.D. in anthropology from the University of Oregon and did undergraduate work at the University of Kentucky. His research interests are historical archaeology, mining history, the archaeology of overland emigration, and human ecology. Hardesty’s forty years of archaeological fieldwork have included Central America and the American West. Clay Landry of Whitehall, Montana, is a material culture expert of the fur trade with numerous articles, seminars and presentations to his credit over the last sixteen years. Some of his major topics include the gear, clothing and food of the trapper, trade goods, and trade ledgers of Fort Hall. He is a member of the American Mountain Men, Inc.
Ronald V. May, RPA, is president of Legacy 106, Inc. and retired from the County of San Diego, California following twenty four years as staff archaeologist and historian in environmental review. He is director of the Fort Guijarros Museum Foundation in San Diego, author of more than fifty journal articles, and knighted by Spain in 1989. Jeff Pappas is currently the National Register Coordinator for the Wyoming State Historic Preservation Office and an adjunct instructor of history at Colorado State University. He holds a Ph.D. in American Indian and Environmental History from Arizona State University. Dean Rudy, a student of western history, is a member of the American Mountain Men, Inc. and the creator of the “Mountain Men and the Fur Trade” website (mtmen.org). He has degrees from Cornell University and the University of Utah and currently lives in Park City, Utah. Roderick Sprague retired ten years ago as Professor of Anthropology Emeritus and Director of the Laboratory of Anthropology Emeritus, University of Idaho at Moscow. Rick is best known for his study of glass trade beads and other trade items from the fur trade period in the Pacific Northwest as well as the study and description of burial practices. Tim Tanner is a professional artist, historian, and educator, residing in a 200-year-old hewn log and timber frame home near the site of the 1832 “Pierre’s Hole” rendezvous, in what is now Teton Valley, Idaho. He has been involved in historical research and living history since the mid-1970s, is on the art faculty at Brigham Young University/Idaho, and is a member of the American Mountain Men, Inc.
David T. Vlcek has served as an archaeologist in the Field Office of the Bureau of Land Management in Pinedale, Wyoming, for more than twenty six years. His field experience includes Wyoming, Illinois, and Central America. He has presented numerous papers on western Wyoming archaeology, including reports on Fort Bonneville, Native American stone circle and rock art sites, prehistoric settlement patterns in the Upper Green River Basin, area fur trade sites, the Lander Trail, and much more. Rick Williams is currently serving as an administrator for Brigham Young University, and is a member of the American Mountain Men, Inc. He has also participated in the Living History Days presentations to school children in May at the Museum of the Mountain Man. Fred R. Gowans, PhD, professor emeritus of Western American history, Brigham Young University, is the Historian in Residence of the Museum of the Mountain Man. Jim Hardee graduated from the University of the Pacific, Stockton, California. He has served as Director of the Fur Trade Research Center since 1998. He is the Museum Factor for the American Mountain Men Association and is the former resident of the Jedediah Smith Society. Laurie Hartwig, BS, University of Wisconsin-Madison, is the Director of the Sublette County Historical Society and the Museum of the Mountain Man. The Sublette County Historical Society would like to thank Sublette County School District Number One Board of Cooperative Educational Services (BOCES) for providing the funding to make this publication possible.